Dear Mark, my Grade 5 students at Dwight School Seoul International located in Seoul, South Korea are very inspired by your song, “Together We Can Change the World.” They would like to sing and play it for their end of year ceremony, Thank you! Just wanted to let you know how much I enjoyed your “Together We Can Change The World!” program at Chester Elementary School. I could see the kids loved it — they totally got into the “ewww” of Abi Yo Yo’s stinky feet, and I loved watching those 3 characters in the front row who loved getting into “Walk in My Shoes” and of course your classic, “Together We Can Change The World” song. Thank you so much for sharing your gifts and posting the vids so us big kids can enjoy them, too! We all loved your program! 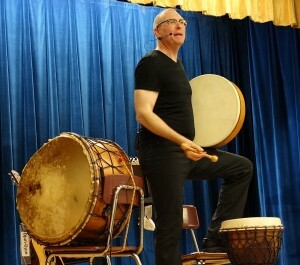 Dear Mark, yhank you for such a fabulous performance at Cherry Valley-Springfield Central School! The students are still singing “The Pool Rap.” It’s been on our YouTube favorites ever since. We hope to have you again in the future! Cheers!!! Your visit to Naramake School last week was wonderful. I bought one of your tapes and my kids just love it. They listen to it every night at bed time they must know every song or story by now, they are always singing the songs. We are also trying to make some of the instruments. I just wanted to say thank you and please keep up the good work. Everyone enjoyed your performance. I only heard rave reviews from the teachers and my own children who particularly had a good time. Such a fabulous Performance!! All the students (K-8) were still buzzing about it the next day. the teachers had nothing but great praise for the assembly. DrumSongStory is tops. Thank you so much for the special evening you gave us. Your program is universally appealing. It was enjoyed by toddlers, grandparents and everyone in between and crossed over cultures and backgrounds! Terrific audience participation! Educationally and artistically valuable. I would recommend this program to any school! Thank you so much! Your storytelling is superb and the use of percussion only enhanced the story. The student involvement brought your performance to till another level. We have never had such a fabulous assembly! Our experience with Mark Shepard was a complete success. The performance was first rate and our students and teachers enjoy a wonderful and creative day. Mark was a delight to work with from planning to performance! Outstanding! The staff surveys have been extremely positive. What went well? EVERYTHING! Excellent performance! Brisk, entertaining and appropriately participatory. Presented for each span of grades at the right level for understanding and appreciation. This was so much better than what I thought I had booked! One student said, ‘Mr Shepard is a master teacher. Language Arts, Geography, Music and even Creole and French were included in his performance of the Drum of The Elephant King.’ I thought her comment exemplified how truly impressive your performance was! I would never have imagined his performance could truly be as breathtaking had I not been experiencing it myself! Mark Shepard is a one man Multi-Media Event!